You all have inspired, encouraged, and pushed me to complete this challenge with you. I didn’t give up because of your love! You held me accountable to post for 30 days about what I am #SteeleThankful for. So much happened this month. I started a new career. I moved out of the storage place, and settling in my new crib. This whole month has been preparing me for this moment. I was blown away. That program has supported me in ways unimaginable. 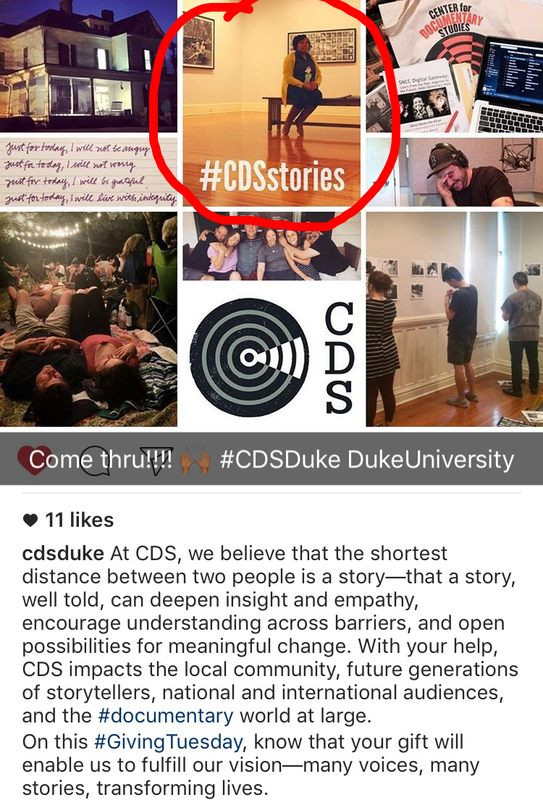 I’m #SteeleThankful for my CDS at Duke family. The main takeaway from this experience is that when you commit to something it’s important to follow through. I was committed to bringing you content, and allowing you to think about what you’re truly thankful for. 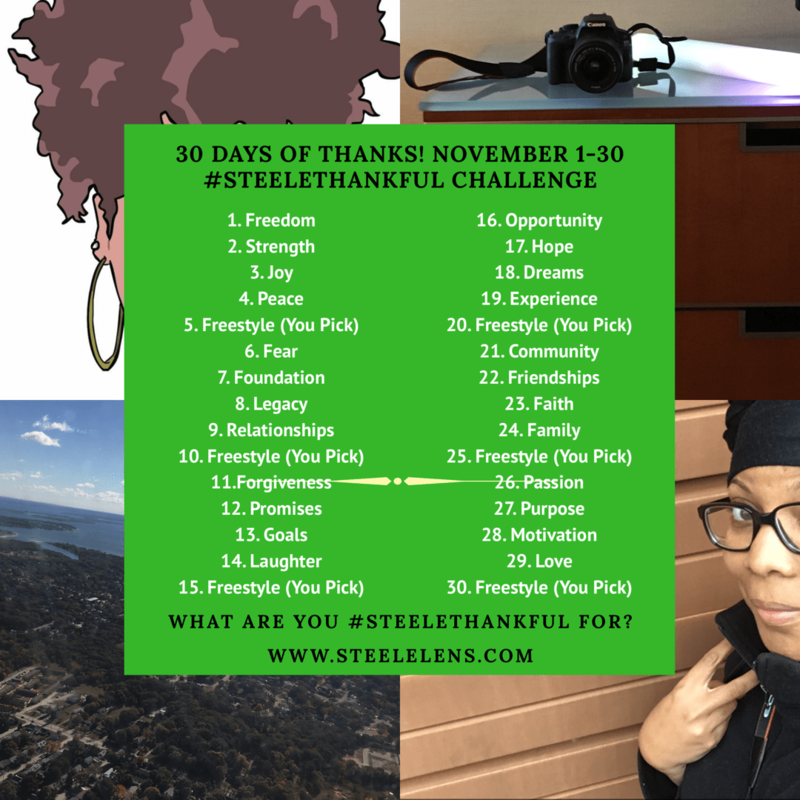 I’m excited about completing this month of #SteeleThankful and preparing for the next chapter that begins tomorrow. For the last time in November 2016, I will ask. Be prepared the challenge for next year will be EPIC! Last year I was apart of two wedding parties. It was an honor to watch people that are so special to me dedicate their lives to walking this journey in life with someone else…as one. This year my bonus sister tied the knot. My sister’s best friend married her soul mate. The biggest honor was her asking if I could help her get in her bridal gown before the blessed event. I was beaming with excitement. My sister’s friends were always viewed as bonus big sisters so I was ready to participate in the big day. Love can come into our lives at the most inconvenient time. A time when we don’t think we are ready to give the love to someone else. We aren’t emotionally available to share ourselves with someone else. Or, we believe that it can’t happen. This day reminded me that you must always be open to love. Not to be naive, but be open to the possibility of the perfect love story changing your life forever. I’m #SteeleThankful for the possibility of love. Pictures like this! This is one of the first photos I received after the book was released. ALL of the above motivates me. My heart melts whenever I receive feedback about the book, or receive a review on the Amazon page. My goal when I started writing the book was that children from all walks of life would fall in love with reading after reading just one of my books. Children/Parents that didn’t enjoy reading before would now love the series. That was my motivation. This entire year has been inspiring, and motivated me to expand the brand in ways I would have never imagined. This is only the beginning for the Adventures of Alleykats series, and I owe it all to you. Your purpose keeps you awake at night. Your purpose is not about money. Your purpose is larger than you. Your purpose is your gift to the world. The Final 48 Project documentary and photography campaign has completely changed my life. I documented the most stories this year. The support and willingness to share the stories of African Americans dealing with grief is something I never saw myself doing. It has absolutely changed my life, and the life of those around me. The documentary has evolved in a way that continues to bring awareness to the dynamic of the black family, and its affect on the world as a whole. My purpose. Lord knows I’ve tried to run from it. I can write, publish, and even travel my life away, but I know that this project is apart of the bigger purpose for my life. I’m #SteeleThankful for the sweet voice of my purpose in the midnight hour reminding me to keep going. The world is waiting on my gift! This year I had a 3rd grade class participate in a book review contest. The students reviewed the first book in my series, Adventures of Alleykats – The Missing President. I was able to read all the reviews submitted, and choose the top three. The students were awarded with a goodie bag, that included an autographed book from yours truly. I can say that was one of my highlights of 2016. I will tell you if you want honest feedback ask a child. They were able to tell me what they liked, and would improve for the next book. I’ve always been passionate about the future of our young people, simply because I had some amazing teachers in my life growing up. It’s never been about the money when I decided to start this series. Don’t get me wrong I’m excited when I’m able to sell books, but to know that your passion for history is changing lives makes this whole journey worth it. I’m #SteeleThankful for the passion to learn, and share my gift with others. On this day I received a delay that lead to a No. I was attempting to tell my story for the photography campaign portion of my documentary, “Final 48 Project.” It was a must that I document the place that my father and I patronized every day the last summer that we spent together. The day I received a No was the day that my outlook changed. When working towards something that you truly want there will be instances when people don’t understand your vision, and when that happens you are presented with a No. I didn’t let that No stop me. I chose another route, and still got my story done. You can check out my story for the campaign here. I’m #SteeleThankful for a new outlook not only for that situation, but life as a whole. I was blessed to spend 12 years of my life with the beautiful woman in this picture. That’s my Granny. I was born a day after her 63rd birthday. She even nicknamed me, “Pride and Joy.” Among other nicknames, but I won’t get into all of that. When she left my world there was a void that could never be filled. There were so many questions that I had for her. Even though she was my granny, all I knew is that role. I didn’t know about the woman that came from Arkansas. How she ended up in Chicago, and eventually settled in Benton Harbor. I wanted to know more about her family roots. My dad provided as much as he could about her family history, but it seemed incomplete. He could only recall what he remembered growing up. (bottom left of featured photo). After my father passed I was compelled to piece together a story for the future generation. I had more questions, that my father could no longer answer. I began researching again while in grad school with the information that my father provided. About a year ago I began going through his things, and found an address book. The last name that he provided years ago matched a name that was in this book. I knew then that my world was about to change forever. I’m looking forward to sharing that part of the journey with the world. Stay Tuned. I’m #SteeleThankful for my family. At the end of the day, we all we got. When I tell you that the FAITH WALK is not easy. Baby…let me tell you. Even the believers of Jesus Christ get weary in this walk. And if you don’t, I’m gone say what kinda faith you got cause I want some. The path can be lit with only a flashlight; meaning you can only see so far down the path. I was traveling down the path of the largest slave plantation in North Carolina when I took this photo. All I could ever think about when I took this drive every morning to report for my internship is that the slaves could see the plantation home from the slave quarters, but how many had to travel this path. This path that lead them to circumstances that were often times unknown. On this path called life’s journey you have to trust God. That’s what Faith is all about. When you can’t visibly see the end of the road you believe that God has already worked it out. Well, that’s the faith I believe in on this day. When the future seems bleak, I find peace in knowing that the path that God has me on is orchestrated by Him. He is the GPS of this journey. I know that the path is leading to unbelievable opportunities. I’m #SteeleThankful for faith the size of a mustard seed. I’ve heard people say time and time again I wish I had friends like yours. Well, my answer is I AINT SHARING! Seriously, it wasn’t always this way. My friends are the bomb DOT com. I seriously have a girl friend that has come into my life at every stage of my existence. I have friends (both male and female) from Pre-K, Elementary, Middle School, High School, Undergrad, Grad, Losing My Father, and then Grad School again. I have had the honor of being a bridesmaid, or hostess at their weddings, holding their babies in the hospital, or watching their kids grow up being corrupted by Aunt R.J. I can’t think of a better group of friends than my circle. They are truly God sent. I’m #SteeleThankful for genuine friendships. I’m nothing without my squad. I had no idea when I started the Center for Documentary Studies program at Duke University that I would meet so many amazing people. They are my community. They keep me grounded, motivated, and accountable for my ongoing work. I can remember where I was standing when Rebecca told me that the Final 48 Project will not work without injecting myself in the story. That was exactly what I needed to hear. The mentors, instructors, cohorts, and support system is something I have never experienced before. They are the reason why I keep plugging away at this project, and future projects. I’m #SteeleThankful for my community at CDS at Duke, they embraced my creative, and often times quirky personality. P.S. Yes, that’s Flat Stanley I am holding. He was along for the ride that week.